E. H. Alger grew up in Melbourne, Australia. After graduating in art and design she went on to a career as an artist and freelance book illustrator, working for many of the major publishing houses as an illustrator (and occasionally as a proofreader and copy editor). She also wrote and illustrated an acclaimed children’s book, ‘Bertie at the Horse Show’, published by Penguin and soon to be re-released by Windship Press. The fantasy tale, ‘Winterhued’, inspired by her love of dragons, unicorns and late-medieval history, is her first novel. With a passion for history and adventure, Elizabeth has travelled widely and voyaged the world’s oceans aboard seven sailing ships including the mighty Russian four-masted barques, Kruzenshtern and Sedov. A horsewoman, animal lover and animal-rights campaigner, she lives in rural Victoria surrounded with rescued animals, including ex-battery hens, roosters, cats, dogs, six horses and a pet Brahman bull. Winterhued by E.H. Alger enters a world of kings, princesses, knights, and dragons. E.H. Alger writes about proud Castle Lawhill built on the edge of a lake, which seems ideal until the residents are cut off from the world by a dragon. King Ger and his daughter, Princess Winterhued, endured the initial attack but their kingdom needs help. There is word of a brave knight who can defeat this mystical creature, but his whereabouts is a problem, and getting off the man-made island to find him is the other problem. During the darkest of trials, the brave are revealed, and it forges true friendships. The princess has been true to her only love but despairs when her father promises her hand to the man who kills the beast that has hindered his frolicking lifestyle. I loved the interaction between the characters. Winterhued is magical as unicorns and dragons appear in a world that has all but forgotten these creatures unless telling tales to their children. Heroes, forbidden love, and the right to rule a kingdom creates a fairy tale of hope. Different characters relate the events as they expound on their experiences with the dragon. The author writes with a poetic beauty and draws the reader to the climax of the ending. There is enough mystery in the plot to make the reader surprised at its twists. Well written, this fantasy tale is fascinating and woven with trust, despair, spite, anger, and hope. E.H. Alger has found her niche and does the medieval genre credit. I would willingly read any work from this author, confident I would enjoy it. I love a good tale set in a feudal period. Who doesn't? 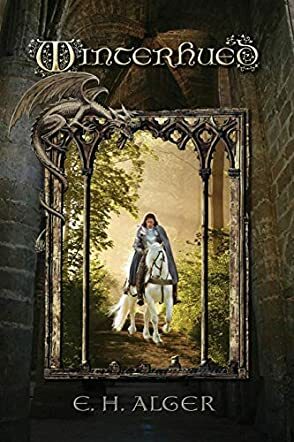 Winterhued by E.H. Alger has all the splendor and romance of medieval life plus the mystery of magic, dragons, and unicorns. I couldn't help but think that this is what the court of Henry the Eighth must have been like with scheming lords and ladies all living there and all of them vying for the king’s favor. I like this book. I like reading about this life. Don’t get me wrong. I know that feudal life was hard. I also know that it was neither fair nor romantic. I would not like to go back and live in those times under any circumstances. But a good writer can make those times shine and E.H. Alger is a very good writer. She made the kingdom of Manydown shine. With descriptive language, a beautiful protagonist and a host of colorful characters, Winterhued will immerse you in its magic. The strength of Winterhued lies in several areas. First is the writing of E.H. Alger. Her mastery of old English sets the tone for the story. In reality, old English in its pure form would be difficult if not impossible for the modern reader to understand and enjoy, but by using words and dialect that most of us know, E.H. Alger delivers the perfect tone that places us in that period. I would say that the characters are the greatest strength of this tale. There are so many. Some of them are definitely stereotypes, but they all serve their purpose. From the king to the scheming Lady Manicia and the hero, Dalgonar, every character is written beautifully and given an arc that’s appropriate. Winterhued by E.H. Alger is a superb example of a period tale relating to those feudal times long gone, when kings with indisputable powers ruled the land with an iron fist; where even attempting to prepare a list of the king’s retinue required many pages; where maidens lost their hearts to gallant knights; where at any time it was possible to imagine that fiery dragons could appear to lay waste to the land and raze entire towns to the ground. And yes, where adventure was basic to having lived a life worthwhile of being lived! Set in the medieval Castle Lawhill in the mountainous kingdom of Manydown, the prologue is itself classic in tenor and tension, ending with the heartrending words: “... she lay blindly, face down, gripped by numbing terror, waiting for talons…” To find out who she is, and what the author wants to convey with the title Winterhued, the pages have to be hurriedly turned, and the many memorable events that follow read with trepidation. I sometimes had to turn the pages back to examine the lineage of the protagonists mentioned in the ‘Dramatis Personae’, many of whom had significant roles in the story. Besides Princess Winterhued, sole heir to the throne of Manydown, who is one of the most memorable characters of distinction that I have encountered in books of fact or fiction, there are amazing original protagonists. E.H. Alger outdoes herself in the literary treatment of protagonists like Ancaios (‘Stench’), from a family of latrine cleaners; Eudora, a sullen scullery maid; a Dark Knight known the world over for his powerful lance in tourneys; counts and countesses, dukes and duchesses, marquises and knights and so many more that I cannot list them here. The princess's father, King Ger, shows his tyrannical and despotic nature to everyone and does not even spare Winterhued. Even some horses deserve hats being tipped to them. The cover is attractive and certainly invites both the romantic and adventurous to look inside. The development of the plot flows smoothly. The pace of the tale is fast with increasing tension leading to an explosive climax. The author deserves accolades for weaving all the many stray threads into a superb cohesive tale. This is a delightful book which merits 5 stars for all aspects of a review. Winterhued is memorable.